Now the weekend is almost upon us, its a chance to do the things we don't get time to do during the week - go shopping, catch up with friends, relax in your PJs, clean the bathroom (sigh) and eat good food (yey). To me, a good roast chicken is the ultimate... But, it takes time. Very rarely do I get home early enough to put aside 1.5 hours cooking time, but thankfully that is what weekends are made for! As much as I love a good traditional roast with all the trimmings, I also like serving a roast chicken in a more 'dressed down' way - with homemade potato wedges and salad. - Follow the guidelines on the pack to cook, most medium sized chickens will take about 90 minutes. - For the first forty-five minutes, loosely cover the chicken with tin foil. This will keep it nice and moist, and then once you remove the foil it gives the skin a chance to crisp up. Don't throw away - you'll use it later! - Before cooking rub a little olive oil, salt and pepper into the skin. If you have any fresh herbs you can also chop these up and rub in, or sprinkle with dried herbs. Some come pre-basted with butter and herbs... why not let someone else do the work for you? - I remove the string around the legs of the chicken before cooking as think it helps the juices to flow and keep the chicken moist. - Stuff a lemon up its bum. Chop in half, and put half up the bum and then halve the left over piece and lay around the chicken in a baking tray. 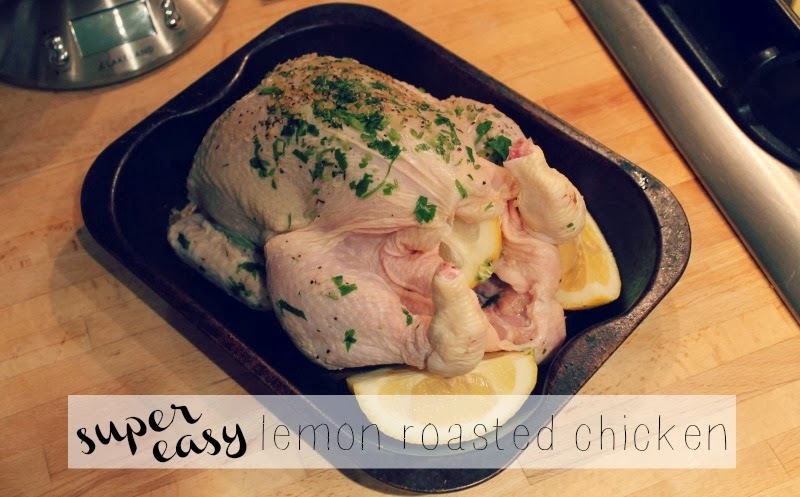 The flavour really absorbs into the chicken, and you can make a really lovely lemony gravy with the juices. Delicious! - Every so often, spoon the juices in the baking tray back on to the top of the chicken. This helps crisp the skin and keep it tasty. - Once cooked (check it is thoroughly cooked by piercing with a knife and checking the juices run clear) leave to rest for about five minutes on a carving tray/chopping board covered with the foil you cooked with and a couple of tea towels on top. Again, this helps to keep the meat moist and full of flavour. - Serve on a warm plate - I find meat often gets cool quite quickly, so keep it hot for as long as possible by warming your plates before hand. Middle aged I know, but worth it! As I say, I love roasted chicken served with wedges and salad. We usually have a bottle of Nandos sauce or similar as an accompaniment, or lemon chicken gravy if serving with veg. Grilled courgette is a great one to have if you'd prefer something warm to salad - just slice length-ways down the middle of the courgette and cook on a griddle pan for a few minutes on each side.